**This book is based on Alice in Wonderland. This book was highly enjoyable. I had no problem relating with Alyssa throughout her adventure--a fairly good Alice in Wonderland retelling with it’s own twists and a nice new Gothic feel to it. 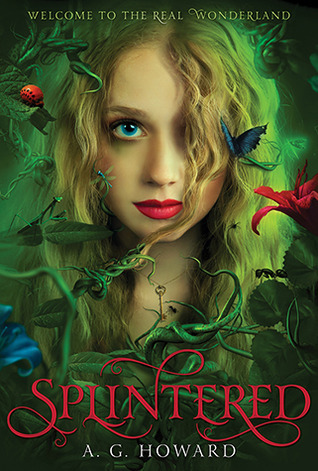 For certain, Splintered does make the original Alice in Wonderland feel even more trippier than I had originally thought. Alyssa is readily likable as a character, with a strength and a uniqueness to her that I don’t mind continuing to follow. The rest of the characters were okay as well. I liked Jeb… to an extent--I think YA guys really DO spend too much time being broody and Jeb is no exception. Now Morpheus (the other point in those pesky love triangles) was a bit conflicting on my scale of “I-like-you-No-I-don’t-like-you”. I had a problem flipping back and forth of my opinion about him, because he would be an arrogant asshat one moment, then he’d become sweet and noble and reliable and you’d be glad that he’s on your side, then he’d become that same arrogant asshat once again, then he’d go all “I’m the best ally you’ll ever have” again… and it just kept going in circles from there. I mostly hated that he always seemed to be right about everything he told Alyssa--no one likes a know-it-all. And if it’s one thing I usually can’t stand it’s the standard Perfect Man™ who is also an arrogant asshat whenever he feels like being an arrogant asshat. I’m not saying he should be perfect and Ghandi, but there should be some middle ground we can all agree on because most men in real life aren’t always just one extreme or another. No, only in fiction. For the two days I spent reading this book, romance-wise, I had a very conflicting love-hate relationship with Morpheus. It was irritating, because I wanted to like him, but then again, I was also rooting for Jeb at moments, because obviously Jeb and Alyssa were going to be Splintered’s OTP. Other moments, I just wanted him to quit getting in the way because Alyssa had a mission to accomplish and he just didn't seem to get it. Between Jeb and Morpheus, I just didn't really have a preference for one guy or the other to win Alyssa's heart. And so, not for the first time, this hopeless romantic actually didn't care if Alyssa ended up attached to someone in the end. I almost wanted the romance angle to get dashed. I mean, I really liked Alyssa--she's spunky, she’s stubborn, she's resourceful, she’s strong, she’s determined... I like that she didn't just sit back and wait for people to come save her. This book was all around about how one girl could overcome anything thrown at her with enough willpower and heart. I enjoyed the adventure she took on, and she proves more than anything that she is capable of taking on the world by herself. But for once while reading a young adult novel, I could have cared less about the romance angle. And I'm not quite sure why. This book was written really well with a lot of great creations--even for a story trying to re-hash all the crazy Alice in Wonderland elements that drove me up a wall just reading the original. I thoroughly enjoyed this one. However, I couldn't help but to feel a little disappointed that there was just something this story wasn't doing for me--and I can't even quite put my finger on it. There were so many things that I really loved about this book... but something always seemed to fall short. In a way, I kind of want to bump this rating up to a 4.5 rather than just a dinky little 4 by itself. Because at the very least, I was hooked and I'm looking forward to what the author could possibly come up with for the next book. I mean, as far as the story goes in Splintered, this book wrapped up rather conclusively that it could stand on its own without any further additions to it. This is a book I WOULD recommend though. It was definitely a great read.